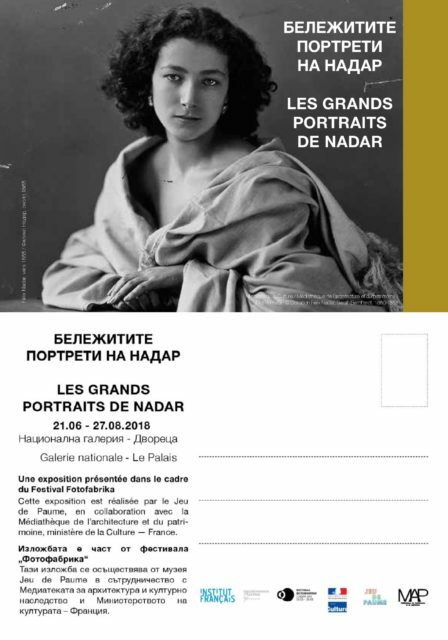 Forty of the best portraits of the world-famous French photographer, Félix Nadar (1820–1910) are presented to the Bulgarian public. Among them are portraits of Sarah Bernhardt, Alexandre Dumas, Claude Debussy, Charles Baudelaire, George Sand, Jacques Offenbach, Émile Zola, Jules Verne, amid dozens of great names from the late 19th and early 20th centuries. The exhibition is jointly organised by the French Institute in Bulgaria and the National Gallery in Sofia, thanks to the prestigious Jeu de Paume Museum in Paris, in collaboration with the Mediatheque of Architecture and Cultural Heritage and the Ministry of Culture of France. This is the final event of the Fifth FotoFabrika Festival. Gaspard-Félix Tournachon, known under the pseudonym NADAR, was born in Paris on 6 April 1820. He worked as a photographer, caricaturist, journalist and writer. Rebellious and daring, with clearly expressed social ideas, he was the first photographer to take a stand against public opinion, ultimately developing his own ideas and tastes. His name has gone down in the history of photography as the first person to take aerial photographs. He introduced the genres of aerophotography and portraiture. He liked to take photographs of those he knew closely. Nadar’s archive contains photographs of almost all the popular writers, poets, artists, actors, musicians and dancers of that time. He was also called ‘the photographer of the stars’; an experimenter and a remarkable artist whose portraits form a Pantheon of his times.